The big story has to be Sunday's Hell of a good Paris-Roubaix and Philippe Gilbert's well deserved win - TOP STORY. Race reports, results, rider quotes and video from Roubaix, Vuelta al Pais Vasco and the Circuit de la Sarthe. In other cycling news: Julian Alaphilippe returns to racing on Wednesday, Victor Campenaerts Hour Record diary, Team Novo Nordisk to ride the Tour de Pologne, Teams announced for OVO Energy Tour Series, Vittorio Adorni inducted into the Giro d’Italia Hall of Fame and racing at 100 kilometers an hour. Monday big read EUROTRASH coffee time! After Sunday's race over the 'Hell of the North' cobbles there was only ever going to be one TOP STORY this Monday - Paris-Roubaix. How can a flat race through a dull part of France, with derelict coal mines, finishing in a rundown town on the Belgian border, inspire so much excitement? I guess it's the unpredictability of the race and the toughness of those cobbled sections. Also there is the throw-back to the early days of bike racing, where all the roads are from L'enfer du Nord. There is never a surprise winner in Roubaix, but there has been one or two outside bet winners, but every win has been epic. This past Sunday Philippe Gilbert played a perfect game, attacked at the right moments, worked hard in the front split and had the best sprint. But he had one thing that every winner of Paris-Roubaix has... Luck! See the Full PEZ Roubaix race report with lots of top photos HERE. Philippe Gilbert (Deceuninck - Quick-Step) delivered a masterclass on the way to Roubaix to claim his fifth success in a Monument, after his victories in Lombardia (2009, 2010), Liège (2011) and Flanders (2017). The Belgian star is the first rider to dominate four different Monuments since Sean Kelly in the 1980s. The race was hard-fought from km 0 until the finish in the velodrome, where Philippe Gilbert out-sprinted Nils Politt (Katusha-Alpecin). Yves Lampaert (Deceuninck - Quick-Step) came third, ahead of Sep Vanmarcke (EF Education First) and Peter Sagan (Bora-Hansgrohe), who also featured in the long-rang attack that eventually led to Gilbert’s triumph. Fernando Gaviria (UAE Team Emirates) fell ill and wasn’t part of the 174-man peloton that took the start in Compiègne under fresh conditions. Riders quickly warmed up with many attacks ahead of the first cobblestone sectors. Experts like Philippe Gilbert, Silvan Dillier (AG2R-La Mondiale) and Alexis Gougeard (AG2R-La Mondiale) featured in early moves but nobody managed to open proper gaps until a very strong move just ahead of the first cobbles, between Troisvilles and Inchy (km 96.5), with a handful of favorites at the front. Maciej Bodnar (Bora-Hansgrohe), Alexis Gougeard (AG2R-La Mondiale), Kamil Gradek and Michael Schär (CCC), Edward Theuns (Trek-Segafredo), Matti Breschel (EF Education First), Nils Politt and Marco Haller (Katusha-Alpecin), Tim Declercq and Yves Lampaert (Deceuninck - Quick-Step), Damien Gaudin and Adrien Petit (Total Direct Energie), Matteo Trentin (Mitchelton-Scott), Stefan Küng (Groupama-FDJ), Frederik Frison (Lotto Soudal), Bert Van Leberberghe (Cofidis), Davide Ballerini (Astana), Jorge Arcas (Movistar), Frederik Backaert (Wanty-Gobert), Reinardt Janse van Rensburg (Dimension Data), Cees Bol (Sunweb), Kris Boeckmans (Vital Concept-B&B Hotels) and Michaël Van Stayen (Roompot-Charles) open a 50 second gap after two cobble sectors. Matteo Trentin, Kris Boeckmans and Michaël Van Stayen were dropped due to punctures. Bahrain-Merida’s hard pace pulled the peloton as they entered sector 23 (km 135). Alexander Kristoff (UAE Team Emirates) suffered different mechanicals and lost his chances to fight for the win. Peter Sagan (Bora-Hansgrohe) and Oliver Naesen (AG2R-La Mondiale) were momentarily dropped to a second group with 115km to go. A 70-man peloton got back together just ahead of the Trouée d’Arenberg. Greg Van Avermaet (CCC) led the pack as they enter the infamous cobble sector (km 162.5). Stijn Vandenbergh (AG2R-La Mondiale) opened a small gap while Wout Van Aert (Jumbo-Visma) suffered a mechanical. Vandenbergh had 10 seconds on the bunch after the sector, Van Aert trailed 30seconds. After returning to the pack the first time, the Belgian star changed his bike and then suffers a crash with 85km to go. He got back again 72km out after an impressive solo pursuit. Wesley Kreder (Wanty-Gobert) accelerated on sector No.16 and was joined by Nils Politt, Philippe Gilbert and Rüdiger Selig (Bora-Hansgrohe). Wout Van Aert reacted, Peter Sagan follows and a very strong group emerged in the sector of Mons-en-Pévèle (km 209): Sagan, Sep Vanmarcke (EF Education First), Politt, Gilbert, Yves Lampaert (Deceuninck - Quick-Step) and Wout Van Aert (Jumbo-Visma). They quickly open a 1 minute gap to a 30-man chase pack. Philippe Gilbert attacked with 23km to go. Sagan and Politt immediately followed. Sep Vanmarcke and Yves Lampaert manage to bridge the gap inside the Camphin-en-Pévèle sector (km 240). Gilbert accelerated again in the Carrefour de l’Arbre but the key move happened with 13km to go, on the cobbles of Gruson. Politt attacked and Gilbert was the only one able to follow. They enjoy a 45 second lead over their chasers after sector 2, with only 6km to go. Sep Vanmarcke had to change bikes in the finale, Peter Sagan gives up and Yves Lampaert moved closer to the leading duo. Gilbert and Politt had a 15 second lead as they entered the velodrome of Roubaix, where the experienced Belgian rider out-sprinted the young German hope. At 36 years old, he is the second oldest rider of Paris-Roubaix in the 21st century, after Mathew Hayman. 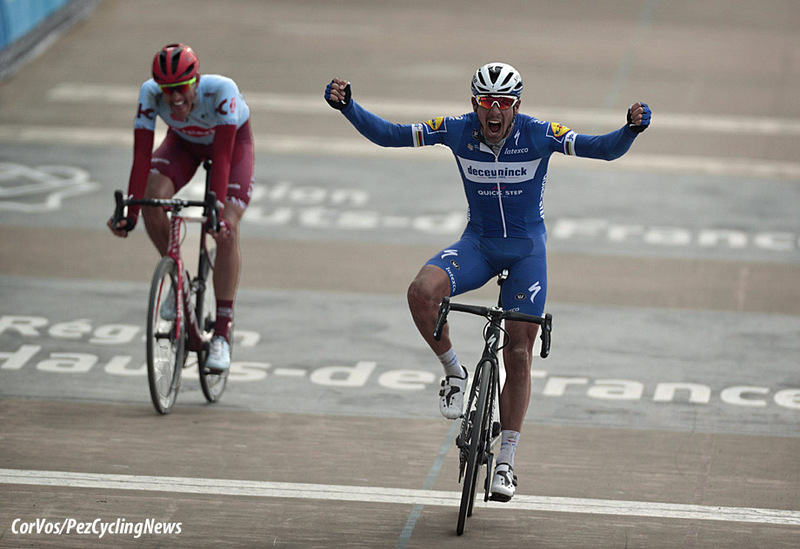 2019 Paris-Roubaix winner, Philippe Gilbert (Deceuninck - Quick-Step): "I have a lot of pain in my back, but it’s quite normal after a race like this. We went really deep today. I knew Politt, knew he was a strong rider and that together we could work and build a gap. I worked really hard for this. I am extremely happy! I was disappointed after Flanders, but in the week leading to Roubaix I returned to training and focused on Roubaix. I came into the race with pressure, because I was very motivated to overcome what had happened last Sunday and go for the win, especially as I felt that I had good legs. It’s hard to believe what I’ve done today, it’s something really special and it will take a few days to realize what has happened and what I’ve achieved. I knew that joining Deceuninck – Quick-Step would be an important step in my career and I am really happy and proud that I’m a member of the Wolfpack. I am the kind of rider who likes new challenges, this motivates me, and here I found plenty of these: from winning Ronde or Roubaix to winning Isbergues, which was a race that was missing from my palmarès. That’s why after today and the celebration we will have this evening, I will reset my mind and focus on the Ardennes Classics, where I hope that the squad’s formidable spring will continue." 2nd, Nils Politt (Katusha-Alpecin): "So close, but even second in Roubaix at my age I still can’t believe it. I was feeling good from the first moment I woke up this morning. For the whole race the team did a great, great job and I think we’ve had such a good classics season. It’s unbelievable to me to get second in Roubaix. I saw in the feed zone that Gilbert wanted to go, so I went with him. With Peter Sagan and his group coming back to us, I didn’t have to go so deep. At the end it was a little bit of bad luck for me that Gilbert’s teammate was coming back to us on the velodrome. Gilbert was willing to gamble a bit. But I still have some years and I hope I can one day win this race." 3rd, Yves Lampaert) Deceuninck - Quick-Step): "It was perfect that we were there with two, Tim (Declercq) and me. We were always in a good position. Then Philippe left. Sagan, Van Aert and I drove there. That too was perfect for us because I didn't have to do the work. We then expanded our lead. At last, Phil was really strong. I'm supercontent with my third place. I like to ride on the strips because you have the best view and take the least risk for puncturing tires or wheel breaks. I thought: we better press the men behind us. With two riders in a top group of six we could play it perfectly. This is great for Phil. Another monument and he has them all. He's a superhero." 5th, Peter Sagan (Bora-Hansgrohe): "It was a very tough Paris Roubaix, with the headwind making it even more challenging. The team did once again a great job, we had some crashes but they all put in a tremendous effort. We followed all the moves until the Carrefour de l'Arbre but in the last 15km I didn't have the legs to respond to the attacks and try to take a podium spot." 26th, Frederik Backaert (Wanty-Gobert): "It was a long fight for the breakaway. I only tried once, but it was the good one. First we were with 9 riders, later a second group came back and it was full gas all day long. I was happy to be in front because it was less nervous between the cobble sections. Finally, the bunch came back just before Arenberg. We were always in good position as a team. Wesley attacked with Gilbert and the race was open. I felt quite good until 10 km from the finish-line. I was totally dead and I lost around 10 places in the final. It’s a pity because I could have finished in top 15. But I had really good legs so it is positive heading to Brabantse Pijl, Tour du Finistère and my favorite race Tro Bro Léon." Medical bulletin Tiesj Benoot (Lotto Soudal): The 117th edition of Paris-Roubaix was one of bad luck for Lotto Soudal. In an effort to return to the head of the race after an earlier crash and puncture, Tiesj Benoot collided with a team car. Examination in the hospital has shown that both the right hip and right shoulder are heavily bruised. There is also a crack in the right collarbone. Besides, Benoot incurred various cuts and bruises. Tomorrow, further examinations will follow to make a definitive diagnosis. The Lotto Soudal rider will not start in the Amstel Gold Race next Sunday. Iljo Keisse (Deceuninck - Quick-Step) was not in Roubaix to celebrate Philippe Gilbert's win as had been taken to the hospital after a collision with some street furniture. "Hospital research showed that Keisse had a complex fracture in the left elbow. Keisse must be operated on in Herentals' hospital", the team announced. How long Keisse will be out of competition is not yet known. 10. Sebastian Langeveld (Ned) EF Education First. 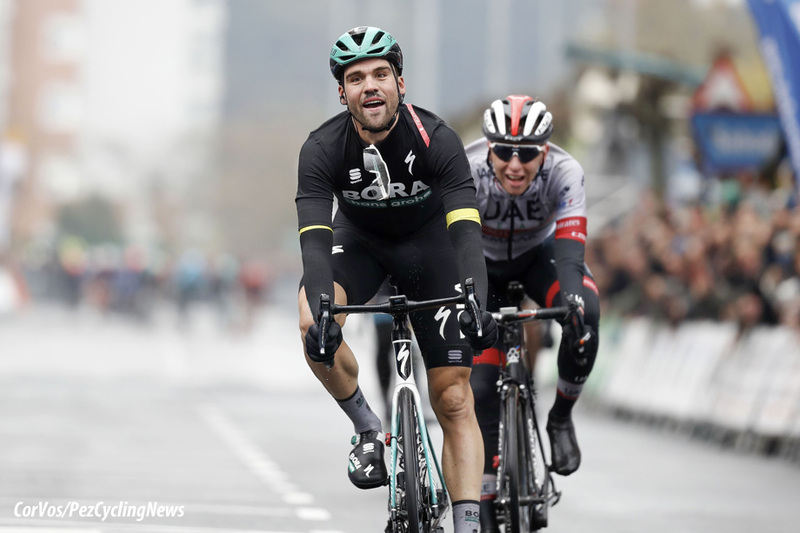 Maximilian Schachmann (Bora-Hansgrohe) won yet another stage of the Tour of the Basque Country on Thursday, his third and second in a row. Tadej Pogačar (UAE Team Emirates) was second at 4 seconds and Jakob Fuglsang (Astana) was third at 7 seconds. Schachmann held his overall lead. Stage 4 was 163,6 tough kilometers from Vitoria-Gasteiz to Arrigorriaga with four categorized climbs, including the Cat 1 climb to Bikotz Gane and a fast descent to the finish town of Arrigorriaga. At the start of the race, the peloton set a relatively high tempo and it took around one hour of racing until a seven-man group was able to distance itself. The peloton never gave the breakaway an advantage of more than four minutes. Bora-Hansgrohe was always visible at the head of the main field, with Pawel Poljanski and Cesare Benedetti being particularly active during this period of racing. On the steep ascent to Bikotz Gane the breakaway group split. At the last intermediate sprint, Patrick Konrad (Bora-Hansgrohe), currently placed third in the general classification, took valuable bonus seconds. Mitchelton-Scott then took over the pace setting in the field, but rain and fog made the chase after the two remaining escapees increasingly difficult, and with 12km remaining, a duo was still riding at the head of the field. A few kilometers before the finish line, several riders were involved in a crash on the wet roads. A group of four riders, including overall leader Max Schachmann, attacked in the last 3 km and raced up the uphill stretch to the finish. In the finishing straight, Schachmann proved himself to the strongest and crossed the finish line first. With this win he extended his lead in the general classification, and also defended his points jersey and best young rider jersey. Stage winner and overall leader, Maximilian Schachmann (Bora-Hansgrohe): "I don’t really know what to say. It’s my third win here and I’ll need some time to process this. The weather conditions were very bad today, even worse than predicted. It was relatively cold and it rained continuously. In the end, I was exhausted, but I was really motivated to win today. I was in a perfect position in the finishing straight, and was able to sprint across the line first. Tomorrow it will be a hard stage, but we will of course do our best to net a good result." 2nd on the stage, Tadej Pogacar (UAE Team Emirates): "It was a hectic stage, with the rain and the cold making everything more complicated” Pogacar said. 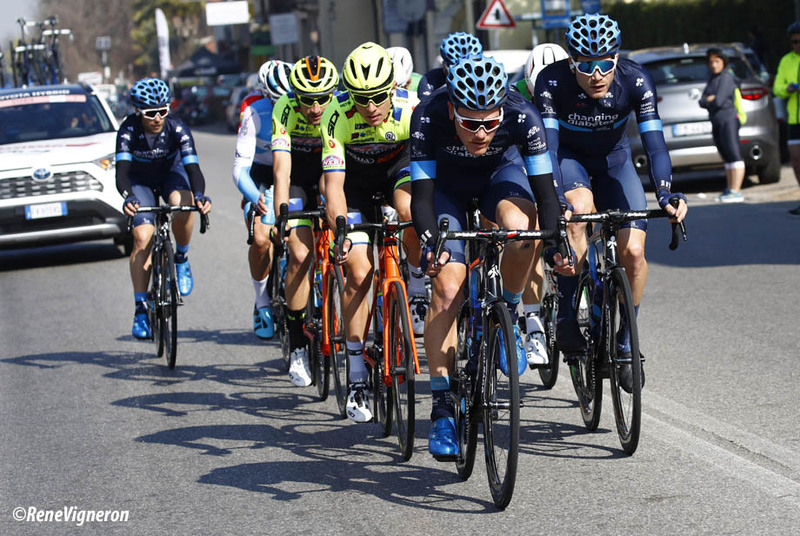 “Our team raced very well, managing to ride all day long in the first part of the group. Thanks to the work of my companions I was able to save energy that was very useful in the difficult final. Six kilometers from the finish, I was involved in a crash, but I was able to get up immediately and return to the group, retaining the brilliance necessary to attack in view of the top of the last climb. I gave my best to try to win, but Schachmann was too strong." 10. Sergio Henao (Col) UAE Team Emirates at 1:31. 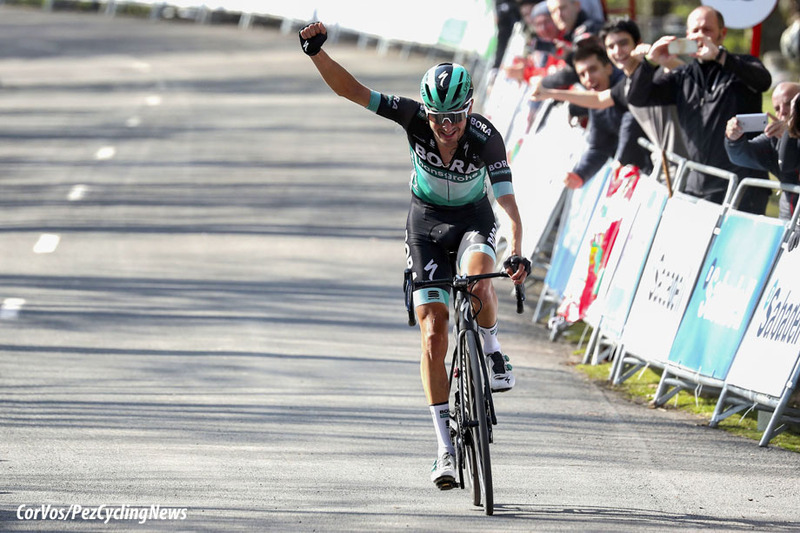 Emanuel Buchmann (Bora-Hansgrohe) took the win on the Queen Stage 5 of the Tour of the Basque Country on Friday and with it, the general classification lead. The 150 kilometer sixth stage started in Arrigorriaga and finished in the iconic pilgrimage church of Arrate. In the first half of the race, the riders had to climb four Cat 3s, before taking on the Cat 1 climb to Izua 40km before the finish. With 2 km remaining, the course went uphill again on the Cat 1 climb of the Alto Usartza. Numerous attacks and changes at the head of the race were seen in the first 100km of racing, before Gregor Mühlberger (Bora-Hansgrohe) and Luis Leon Sanchez (Astana) were able to put some distance between themselves and the field. The duo was pursued by a 25 man strong group. On the brutal climb to Izua, Emanuel Buchmann was able to make the jump into a small leading group with Sergio Henao (UAE Team Emirates) and Valentin Madouas (Groupama-FDJ), and from there, he attacked at the foot of the next climb. Several riders took up the chase behind him, but he was too strong and they were not able to catch him. With that move, he took the victory and the lead in the general classification. Teammate Max Schachmann was able to defend his blue and green jerseys, and Bora-Hansgrohe lead the team classification. Stage winner and overall leader, Emanuel Buchmann (Bora-Hansgrohe): "It’s unbelievable to win the queen stage of the race, and also to take the lead in the general classification. I hope to be able to defend the yellow jersey tomorrow. I am optimistic, because we have a very strong team here. Every day, we try our best to win, and we’ll also try the same on tomorrow’s stage." KOM, Alessandro De Marchi (CCC): "It was a super hard stage. At the start of the day, I tried to focus on going in any breakaways and my second goal was to try to take the jersey. But, in the end, my second goal became my first one because we saw immediately that the bunch didn't want to let any moves go.” “So, with a different type of start, I could save a bit more energy and stay with the first bunch. However, after spending so much energy in the first 90 kilometers, it was impossible for me to stay there until the end so, I took the decision to drop back and save my legs for tomorrow. We now have a jersey to defend." 10. Tadej Pogaar (Slo) UAE Team Emirates. After Friday’s queen stage to Arrate; the Astana team was super motivated to try its best on the Final Stage 6 to fight the lead in the general classification away form Emanuel Buchmann and his dominant Bora-Hansgrohe team. The 6th stage has started in Eibar with a number of attacks and, finally, a big group of 18 riders went away, getting an advantage of a minute. Later, the Astana riders came to the front of the peloton and increasing the pace dramatically. Two short, but quite steep climbs, Kalbario and Elkorrieta were covered at a fast pace, so fast the breakaway was caught. As they were pulled back it Jakob Fuglsang who launched a powerful attack, followed by Ion Izagirre and later by Adam Yates, Dan Martin and Tadej Pogačar. Finally, this group was able to get away, creating a good gap. The leading group worked hard to stay out front with Jakob Fuglsang pulling hard to help Ion Izagirre. With 3km to go Adam Yates attacked from the leading group, taking the stage victory, with Dan Martin second. Jakob Fuglsang took third and Ion Izagirre fourth. This gave Izagirre the final victory in the general classification. The yellow jersey group of Emanuel Buchmann finished at 1:24 behind the stage winner. But, because Buchmann missed the corner inside the final kilometer, he was given the wrong result, which put Astana’s Jakob Fuglsang in third place overall. Jakob took part in the podium ceremony, but later, the race jury decided to review the results, giving Buchmann back some lost seconds, and 3rd place on the overall standings. 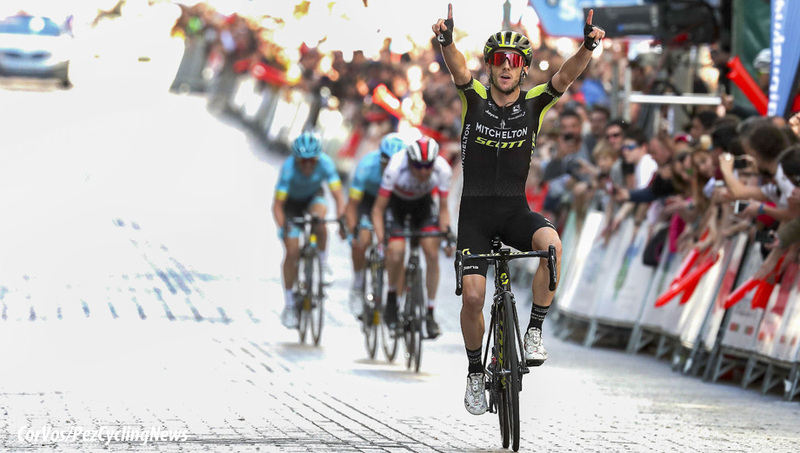 Stage winner and 5th overall, Adam Yates (Mitchelton-Scott): "Today we knew it was the last chance to win and I think Astana had the idea they wanted to win the GC. It was a crazy day, just like yesterday, the pace was super high all day and I think when Bora had the lead, teams like Astana knew they really had to push the pace to drop these guys, so they had to start early. With 65 kilometers to go, the pace was super hard and luckily I had some teammates there to really push the pace. Then from there on the five of us worked well and it was just in the final when I attacked and managed to stay away to win, so it was a really great day." 4th on the stage and overall winner, Ion Izaguirre Insausti (Astana): "I am so happy! It is a very special victory for me! After so many podiums, finally, I won this race. It is very special because it is my home race and all my family and friends were here at the finish to support me! So, I could share with them this great success! – said Ion Izagirre right after the finish. We have a very strong team here and we knew we have to try something today to fight for the overall victory. We knew that this was possible to do. We had a great tactic for the stage and all team did an amazing job to provide me and Jakob the best moment for attack. Later, in the break Jakob was absolutely great and I want to thank him for today. Indeed, it is a team’s success, we rode really well as a team during this week and, finally, we’ve got this win!" 2nd on the stage and overall, Dan Martin (UAE Team Emirates): "We were very strong throughout the stage, it was a very nice day for the team. We all found ourselves racing with great motivation, everyone had important goals and so we pushed hard to the finish line. I would have liked to have won the stage, but Yates took a small advantage on the last climb. I knew I would have won if I managed to come back to him, but it was a bittersweet ending. I did, however, take second place and second overall, and that means something." 3rd overall, Emanuel Buchmann (Bora-Hansgrohe): "We wanted to defend the yellow jersey today. We let a dangerous group go, and Astana tried to attack, and they were able to do that. Fuglsang rode super strong and I was not able to keep up anymore. Max and Patrick helped me then, but the gap stayed at around 1:40 minutes. It was good enough for a podium place, but unfortunately we lost the yellow jersey." 3rd on the stage and 4th overall, Jakob Fuglsang (Astana): "Honestly, it was a very strange decision of the jury. Of course, I am disappointed with it. I think, this is not normal, when you do all the podium ceremony and, finally, remain fourth. I did not know, what happened there behind me, but all this situation looks so wrong and ridiculous. Anyway, I am happy for Ion Izagirre and his victory. It was our goal today and, in general, at this race. Today we were very motivated and we did all we planned. In the break I just gave my best, I pulled in front as much as I could and I never thought about my personal result and my position in the general classification. It was all or nothing for Ion and I am proud I was part of this great win!" 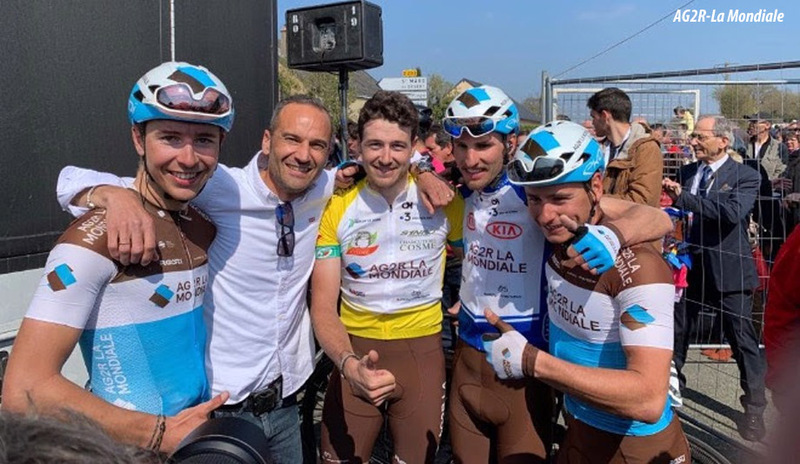 With his overall win at the Circuit de la Sarthe, Alexis Gougeard chalks up the third victory for the AG2R-La Mondiale team this season. Gougeard also just won in the third stage at la Sarthe. And then earlier in the season, Alexis Vuillermoz won the Royal Bernard Drôme Classic. Final overall winner, Alexis Gougeard (AG2R-La Mondiale): "As you might expect, the final circuit was very complicated! Despite that, I had a team of warriors with me, and the guys really managed the situation perfectly all day; everyone stayed together extremely well. This is my second overall victory in a stage race (after winning the Tour de l’Eurométropole in 2015), but that's not what I will remember most. After a complicated year in 2018, I am again just enjoying being on the bike now. I am happy with this victory at the Circuit de la Sarthe, but I do not want to stop there! This Sunday, I'm going to be at the start of Paris-Roubaix. I love that race, I have great memories from there, and I'm going work as hard as possible for the team." 10. Mathieu van der Poel (Ned) Corendon-Circus at 1:22. 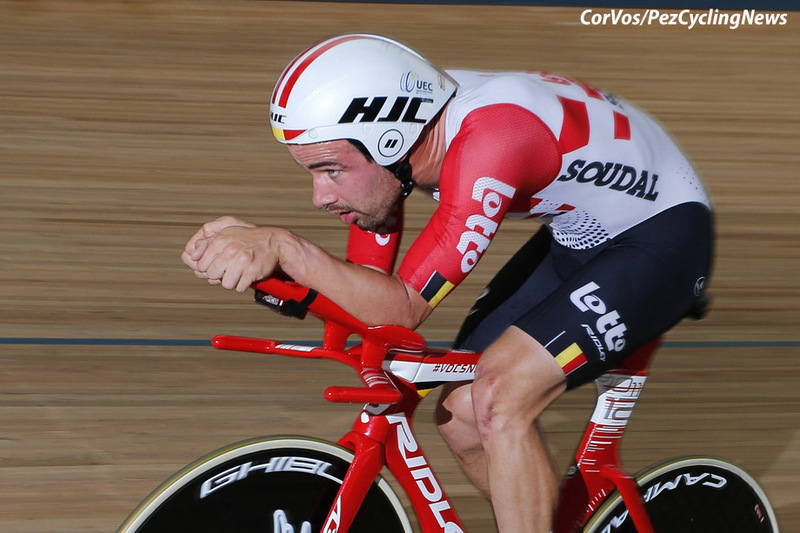 The 26-year-old Frenchman will make his first appearance in three years at Brabantse Pijl. Following the crash that forced him to abandon Vuelta al Pais Vasco, Julian Alaphilippe has undergone further medical examination and scans that have revealed that he has not suffered any fractures. While the injuries sustained by the crash will still cause him some discomfort, he is expected to make a recovery ahead of the Ardennes Classic, with Julian returning to racing on Wednesday, at Brabantse Pijl. 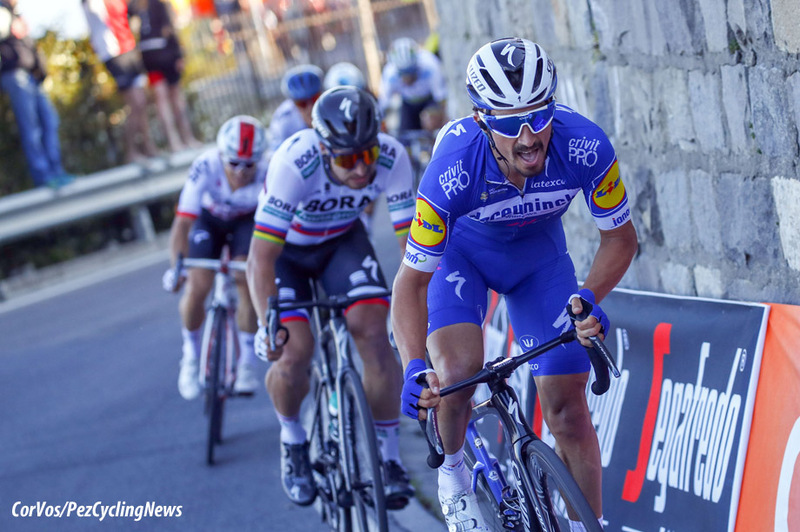 Now in his sixth season with Deceuninck – Quick-Step, Julian Alaphilippe is the most successful rider of the year, having amassed eight victories so far, including the first Monument of the season, Milano-Sanremo. Team Novo Nordisk announced that it received a wildcard invitation to the Tour de Pologne. Team Novo Nordisk CEO and Co-Founder Phil Southerland: "First, we would like to thank Lang Team for inviting Team Novo Nordisk to the Tour de Pologne. This race carries enormous prestige, and we are eager to continue showing the team’s jersey and sharing our mission to inspire, educate and empower everyone affected by diabetes. This will be Team Novo Nordisk’s only race in Poland where more than two million people live with diabetes. With the global reach of this race, we are able to show the value of exercise not only to Poland but to the entire world." Team Novo Nordisk General Manager Vassili Davidenko: "It is an honor to receive a wildcard invitation to the Tour de Pologne. We took a year off from this incredible race so we could continue investing in the development of our athletes and we are motivated to return for our third Tour de Pologne. Headlining the entry lists, which feature seven men’s and eight women’s teams competing in all seven rounds, are respective defending champions Canyon dhb p/b Bloor Homes and Team Breeze. The final six teams in the women’s series are Brother UK – Tifosi p/b OnForm, Datalynx - Parenesis Cycling, Liv AWOL SPOK’D, Jadan Weldtite, Team Boompods and VeloPerformance. As it stands, the men’s series will feature five of the six British UCI Continental teams, with 2015 champions Madison Genesis joining Canyon dhb p/b Bloor Homes and Vitus Pro Cycling p/b Brother UK, plus series newcomers Ribble Pro Cycling and SwiftCarbon Pro Cycling. 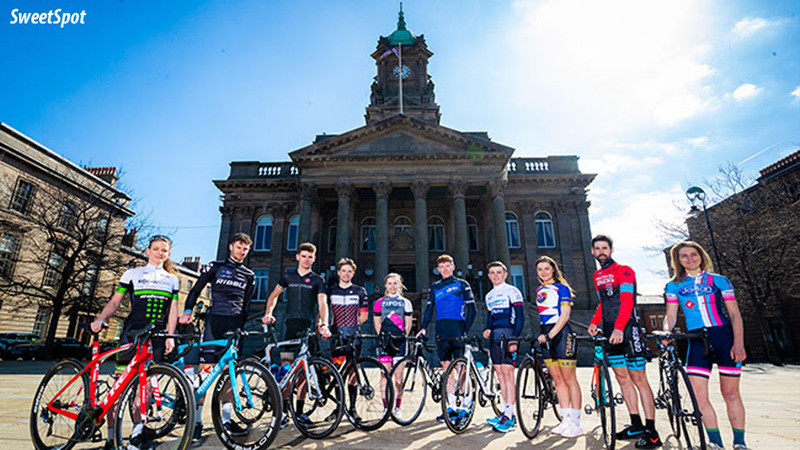 Two other debutants will be Bikestrong-KTM and Saint Piran, the latter a de facto Cornish national team who make the step up to the full OVO Energy Tour Series just weeks after their home county was announced as the Grand Depart for the 2020 Tour of Britain. 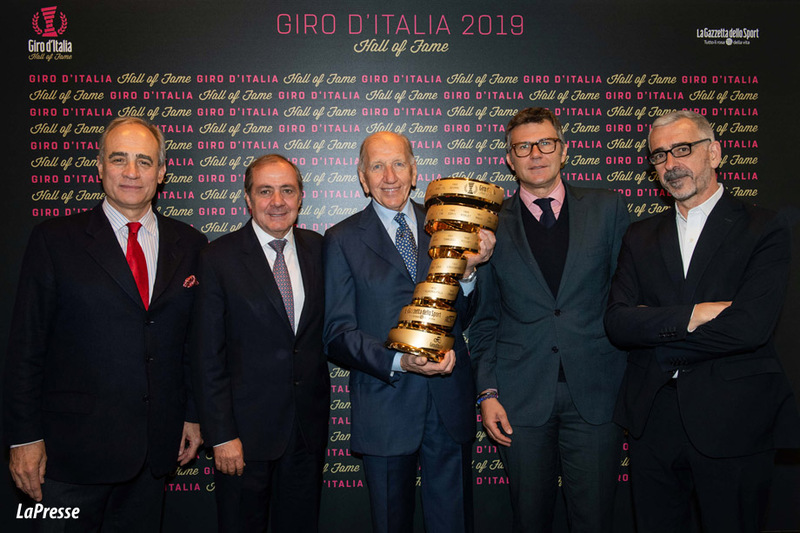 Vittorio Adorni, today in his native Parma, has joined the Hall of Fame of the Giro d'Italia, receiving the Trofeo Senza Fine that is awarded to the Giro winner since 2000. 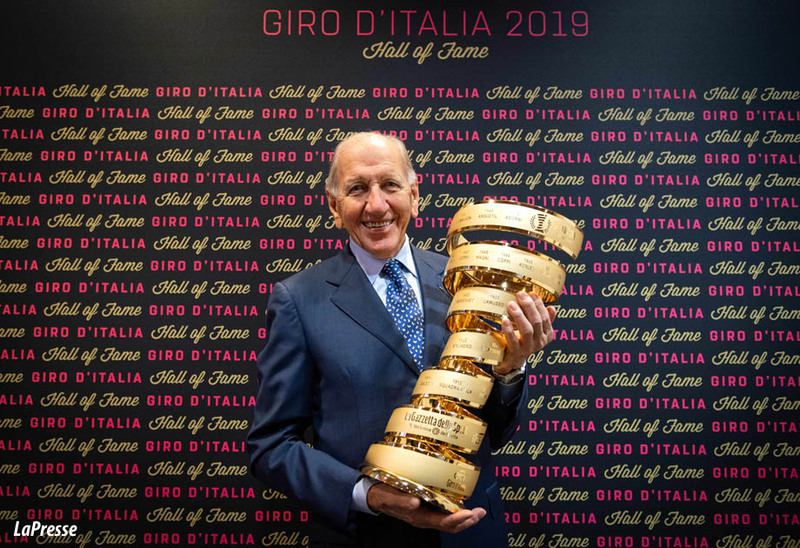 In Italy, Adorni has achieved his most prestigious successes: the Giro of 1965 - wearing the Salvarani jersey - and the victory in the Road World Championship at Imola in 1968. Vittorio Adorni proudly accepted the acknowledgment: "It is really emotional for me today and I think it is very nice that the Giro d'Italia remembers the riders that did something important in this event. 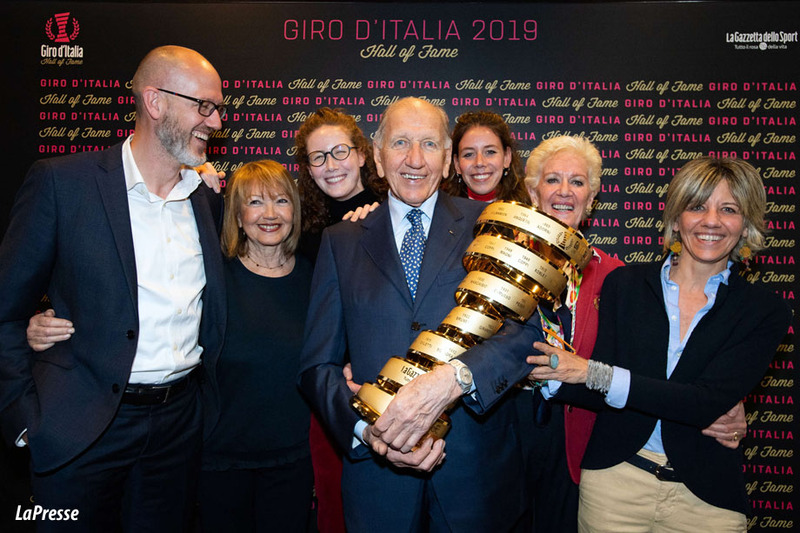 The Giro was the dream of every rider, in particular of the Italian ones, and that dream, for one reason or another in my case, continued to fade. 1965 was a year that found me ready both physically and mentally. I had taken back the Maglia Rosa in the 13th stage, a 50km Individual Time Trial from Catania to Taormina, and though I knew that the race would still be long and full of pitfalls, I never lost it again. The key stage was the Saas Fee - Madesimo, a 282km long stage with four KOMs before the finish line. I won that stage with over three minutes of advantage and consolidated my first place overall." 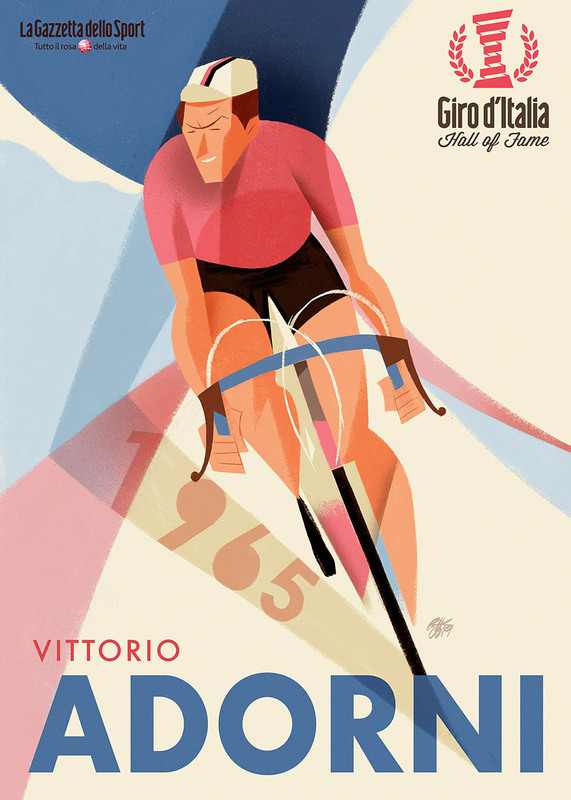 In 1962 Adorni won his first stage of the Giro, the Moena - Aprica; a feat he repeated in the following two years, winning two stages each. In 1969, Adorni's last stage success at the Giro was in the Cavalese - Folgarida stage.